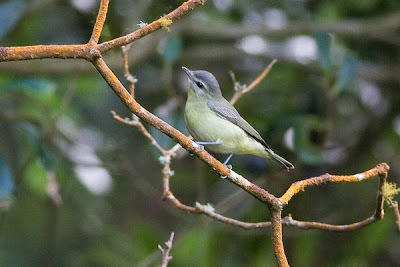 Birding Corvo 2009: Philadelphia Vireo! Good harvest today again! Team Spain went looking for yesterdays birds while me and Simon hit Ribeira do Vinte. After scanning the outer parts of the valley we went inside it to have a look. Pretty soon i noticed something small moving around in the tops of some trees and alerted Simon but he didn't see it as the bird had dropped down among the trees. I was pretty sure that it was one of the pale vireos (Philadephia/Warbling) but the bird was gone. After an hour of rain and wind we glimpsed the bird again, but again only from below. Now we were sure that it was a Vireo, but which one of them!? The hours passed and we just couldn't find the bird again! While searching for the Vireo we heard a sharp call and Simon also had brief views of a small bird in the tree tops. We heard the bird several times again but never got any views of it - VERY annoying! After looking for the Vireo for almost five hours getting soaked by shower after shower we had a short lunch break and then tried to find it once again. And then suddenly, there it was! A beautiful Philadelphia Vireo! 2nd for Corvo and 5th for the WP! On our way out of the valley we heard the American warbler again, but didn't see it this time either. Happy to have nailed the vireo but PISSED-OFF about the warbler we left the valley and headed towards new adventures. Didn't see very much else of interest that day. The Bar-wit and the Pec still around the village but no small Egret or Eider today. This beautiful picture was taken by Ferran Lopez Sanz. Team Spain had a great first full day and managed to twitch all three megas present on the island; Black-and-white Warbler, Black-throated Green Warbler and Philadelphia Vireo! Now they are in the game and tomorrow the four of us will do our very best to find whatever might be out there. Olof, your tripp will be classic! Come on! What's gonna be next? ""I know what you're thinking punk. Does it fire six shots or only five? Now, to tell you the truth, I forgot myself in all this excitement... But being this is a 44 Magnum, the most powerful handgun in the world, you could ask yourself a question; do I feel lucky? Well, do you punk?